No book is perfect, but the authors Joan Robinson and John Eatwell have closely reached the ideal. What is served here, is definitely top class. 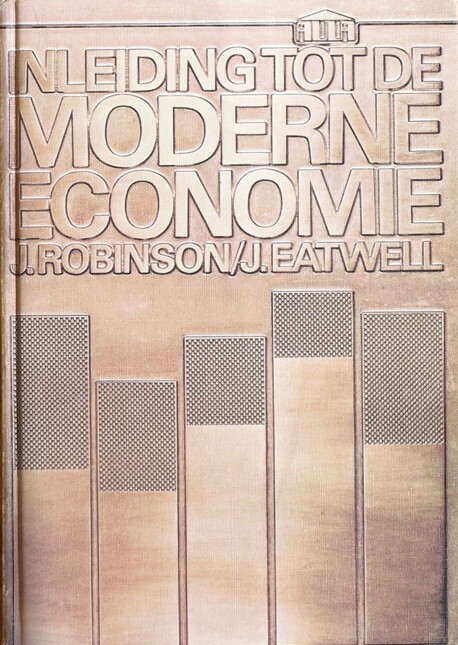 The book of the two J's first appeared in 1973, under the title An introduction to modern economics. After four years Het Spectrum published a Dutch translation. That required courage, because sales would be a Jack-in-the-box. Firstly, the book forces the reader to reflect. Not everything is immediately obvious. And secondly, the contents is somewhat controversial. It is precisely this controversial character, that prompts to write a review. Of course the book is only available in antiquarian bookshops, especially for those who prefer the Dutch edition. But the book is worth the search. The authors are vehement opponents of the neoclassical theory, which today dominates economics. For Joan Robinson, nota bene the most famous female economist ever, the fight against this theory has been a life-work. She abhors prophets, who always eat dry bread. Therefore the authors have kept out in a rigorous manner all aspects of the neoclassical theory from their Inleiding tot de moderne economie. This has advantages and disadvantages. The advantage is that the beginning economist is not lead astray by neoclassical fallacies. The disadvantage is that reading this book gives little information about the neoclassical approach. And yes, that is the main stream. Even if a paradigm is controversial, a knowledge is still required, as long as it is widely used. Therefore the book is the perfect introduction, but perhaps not the best introduction. Robinson and Eatwell really judge all economic paradigms on their merits. They begin their argument with a historic survey of the various economical theories. Due to their fondness of eating the sweets from others some have reproached the two J's, that their book misses a leading thread. Apparently sometimes even abundance is not enough. Just an example of the opinionated approach of J&J: in the chapter about the production factors they treat the factors land and labour on an equal footing. This is the historic method, like it has been developped by for instance David Ricardo. In the modern texts it is common to neglect the factor land, and thus they miss the opportunity to explain the price formation for a scarce resource (which land is). Your reviewer, to give another example, is pleased with the idea of the authors to explain the use of credit on the basis of bills of exchange. These are the first appearances of credit, and place the reader in the midst of the real trade. In the post-war years Robinson has participated actively in the Keynesian revolution. Not surprisingly she introduces this theory early in the book. The chapter 6 (there are 17 of them) is even literally called De effectieve vraag. Here she and Eatwell prefer the theory version of Kalecki, because Kalecki discusses the distribution in wage and capital incomes. Keynes himself ignores the question of distribution1. In addition J&J describe here the effect of the multiplier. This is done by means of a simple two sector model (agriculture and industry), which allows to calculate the economic growth. Indeed Robinson and Eatwell have a delightful preference for practical examples. At least your reviewer derives the benefit of insight and economic education from this approach. Another surprising example can be found in the paragraphs about the economic conjuncture (business cycles). In that example the authors perform a calculation concerning the formation of a crisis. Since they again employ the formalism of Kalecki, also the behaviour of the incomes can be traced during the break in the conjuncture. Your reviewer does not know another simple paradigma, that has this same capability. And yet, despite these calculations most of the content is a narrative, with lots of text. The amount of formulas remains limited. Justo jure (rightly so) the authors leave out statistical data from the economic reality. The J's believe that it is more important to grasp the essence. Next to its diversity and originality Inleiding tot de moderne economie is also a sincere book. The authors do not try to invent justifications for the large differences in income and fortune. The origin of the business profits is analysed, and connected to oligopolistic structures. The role of the state in the control of the effective demand and the stabilisation of the economy is discussed. And banking and international trade are examined. However, the authors still live in the era of Fordism, which has corporative traits. The neoliberalism seemed for away (it still does). So the present-day person has to adapt the text to his new reality. Fascinating is again the chapter about the plan-economy, also called socialist planning. The J's analyse the principles, that form the basis for the planning at the national level. The paragraph about the so-called "first socialist accumulation law" (accelerated growth in the manufacturing of machines) is a revelation, certainly for your reviewer. Here the model of Feldman is explained, again in an example (yes!). It is an excellent illustration of the application of additional investment, such that the long-term perspective for a higher level of consumption improves. This is clear by intuition, but the phenomenon becomes tangible thanks to the calculated graphs of rising curves2. All other introductory books remain silent about Feldman (or something which resembles it). This is striking, in particular to those who know, that this type of model is the foundation for all planning. The last 50 pages (of 400) are devoted to the political economy. The authors describe the global situation, and give comments. The reader, meanwhile provided with valuable knowledge from the preceding chapters, is sufficiently qualified to understand the choices in the international politics. Here some attention is given to the politics of exchange rates. The final chapters analyse the situation and the problems of the Leninist countries (say Comecon) and of the Third World. Once again the J's state clearly, what really matters. It can not be repeated enough: this book contains lots of instructive information, that is lacking in other introductory books. Juncta juvant (united forces can achieve a lot). The authors bring in a solid backbone of knowledge in economics. So who lacks access to this book, will miss essential information (or will have to consult specialized books). Unfortunately Inleiding tot de moderne economie has never gained popularity among the university staff, who prefer to stick to the neoclassical paradigm. They live on their fat. But your reviewer (what's in a name?) furnishes this book with a fat recommendation.